Extended fasting is when you don’t consume any food for an extended period of time. Any fast that goes beyond 24 hours would be considered extending fasting, in our opinion. We have previously completed a couple of 2-3 day fasts, but never been able to go beyond that. 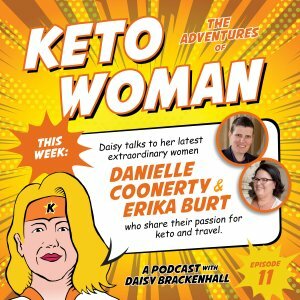 Extended fasting is a great tool to have in your keto lifetstyle, but it definitely doesn’t suit everybody. We have no health issues and have done a lot of research into fasting and felt confident in identifying when we would need to stop. We also both have enough body fat to fuel ourselves during a fast. It is not recommended for people with a history of eating disorders and people that have a low body fat percentage or are underweight. If you have any medical conditions like diabetes, heart disease, cancer or other health conditions or take prescription medications, it is always recommended you consult a health professional prior to partaking in an extended fast. 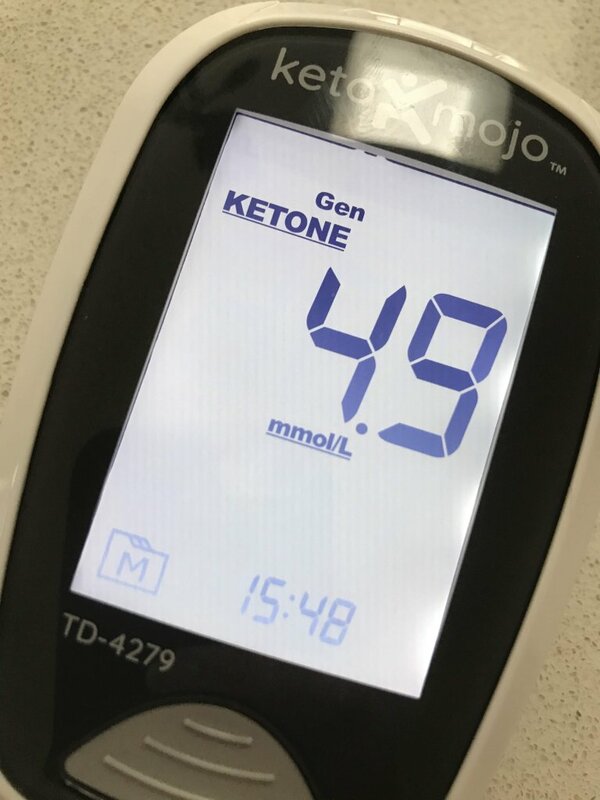 If you are keen to incorporate fasting into your ketogenic lifestyle and feel you may need extra support or you cannot get the support of your health professional, we highly recommend contacting IDM. IDM is Intensive Dietary Management and is run by Dr Jason Fung and Megan Ramos. 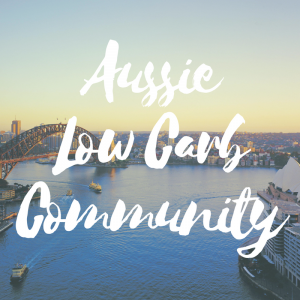 They offer several ways to be a part of their program including being a member of their free community, paid community membership and personalised coaching. If you are interested in the personalised coaching, it is an online service, which is great for everyone worldwide. We used the extended fast as a reset after a feasting period while we had family visiting for two weeks. This was not done as punishment at all, we just wanted to reset our diet and also challenge ourselves to see if we could get to 5 days. On our 5 day extended fast we noticed improved mental clarity and concentration, increased energy, reduced inflammation and some weight loss. We also found a couple of negative side effects including bad breath due to our very high ketones, restless sleep due to the increased energy, some nausea and Erika experienced a headache on the first few days. 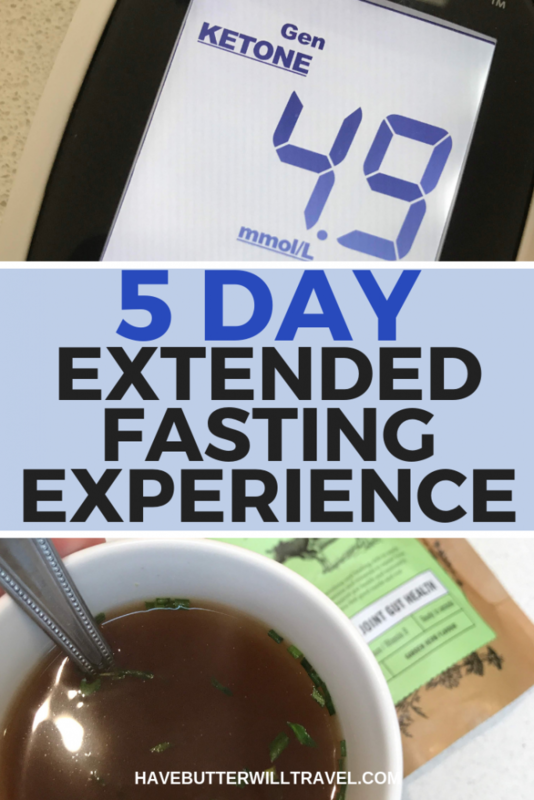 If you are interested in further information around the benefits of extended fasting we highly recommend the Complete Guide to Fasting by Dr jason Fung and Jimmy Moore. We loved having this book on hand while we were fasting as a guide. Well this probably seems obvious , but we definitely drank water during our fast. Not only to keep ourselves hydrated, but also as a tool when we felt hungry. We also enjoyed some sparkling mineral water once a day for a bit of variety. Hydration is really important when fasting and we tried to consume water when we were thirsty or hungry. It is possible to go the other way and over hydrate, so listen to your body and consume water as needed throughout the day. If you are consuming a lot of water and are still thristy, this can be a sign of low electrolytes. We found our salt intake to be really important while fasting. Whenever we felt hungry or a little unwell we would take some Himalayan pink salt under our tongue and it would help. We would recommend having some salt on hand. Dan took some to work with her, to help curb those hunger pains. We also added salt to our electrolytes and our bone broth to make sure we consumed enough. We really noticed the need to supplement our electrolytes when we did our carnivore month and we had Ultima electrolyte supplements on hand that we took daily during our fasts. The Ultima electrolytes are zero calorie and contain Magnesium, Sodium, Potassium , Chloride, Calcium, Selenium and Zinc. We have tried all the Ultima flavours and prefer the raspberry the best. Ideally for fasting you would choose an unflavoured option, so as not to trigger any sort of blood sugar or insulin response, but we had these already so used them. For Aussies, we buy ours from Low Carb Emporium. Use our code HAVEBUTTER5 for a discount. We both love to drink tea and luckily we take it black with no sugar so this was not an issue while fasting. We like to drink Lady Grey tea in the morning and then other herbal or green teas later in the day and in the evening. I love my one coffee a day and continued to drink my cold brew coffee during our fast. In Dr Fung’s book they allow 1 tablespoon of cream in your coffee during your fast, so I included that as I am not a huge fan of black coffee. I didn’t add any sweetener to my coffee, which I do normally include sometimes. 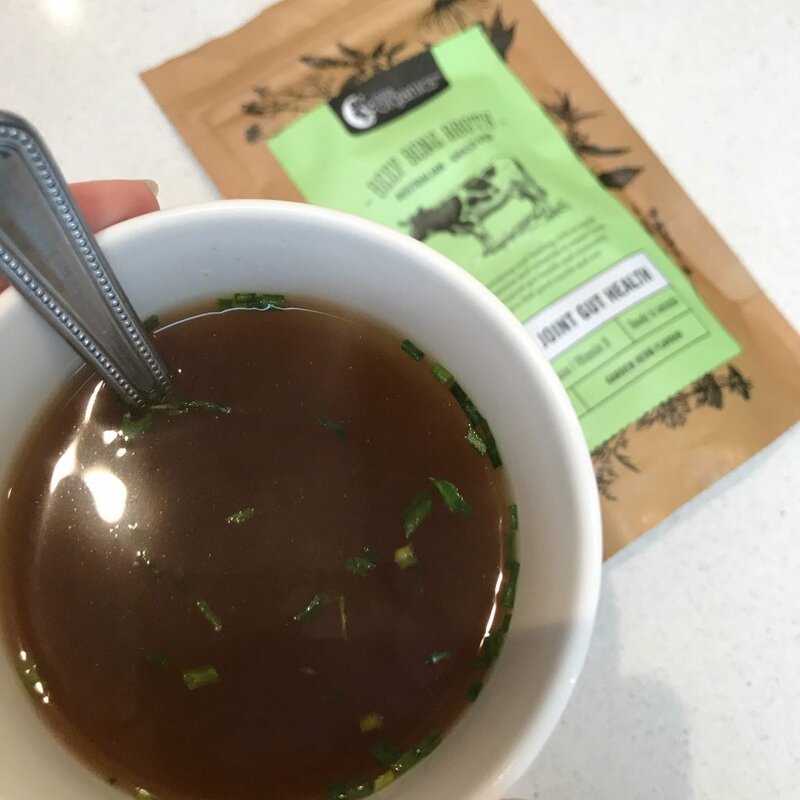 During the fast we decided to include a cup of bone broth in the evenings wen we would usually have Dinner to help with any hunger pangs. We like to make our own bone broth and usually have some in our fridge and freezer as Dan likes to have a bulletproof bone broth in the morning after the gym. If we don’t have any of our home-made bone broth available we like these options from Amazon; Epic and Kettle and Fire. For Aussies we like the Nutraorganics and Meadow and Marrow options from Low Carb Emporium. Use our code HAVEBUTTER5 for a discount. When breaking an extended fasting it’s important to consider a re-feeding strategy. We used The Complete Guide to Fasting to guide us on the best way to do this. Erika broke her fast with one serve of macadamia nuts and Dan broke her fast with one serve of salami. An hour after breaking our fast we consumed our first meal, dinner. 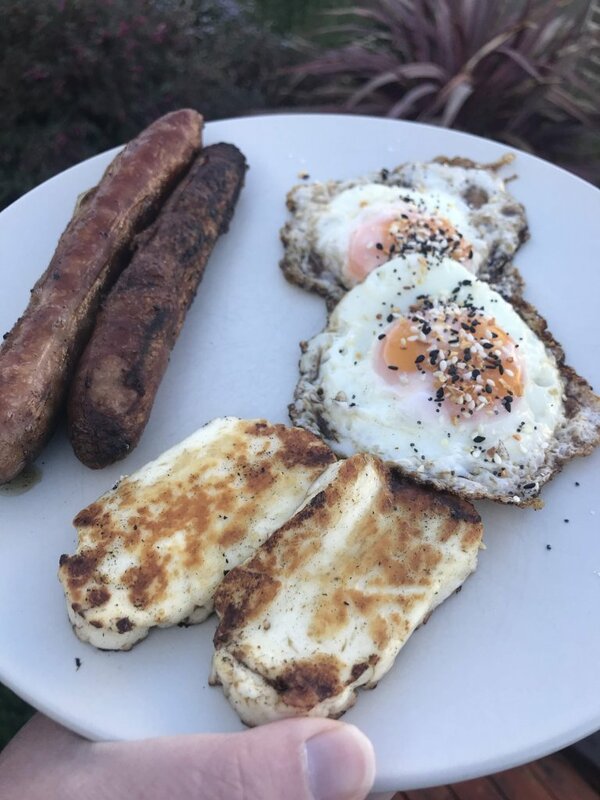 Our first meal was 2 sausages, 2 eggs and 2 slices of halloumi. It was possibly the most satisfying meal we have even eaten. We were completely satiated after this and didn’t eat our next meal until dinner the next day. Dr Fung’s advice is to feast when you are not fasting. 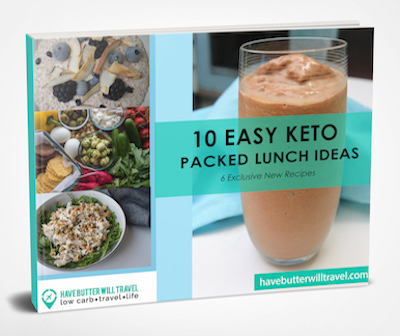 We enjoyed lots of keto meals and snacks a couple of days after our fast on the weekend. I found the 5 day fast challenging at times and very easy at others. I think that would be pretty common when doing extending fasting. After the second day the hunger definitely disappeared and I never got the headache I expected. I didn’t experience too much grumpiness either. I would have expected more. The first 2-3 days I definitely felt strange. I found myself making mistakes when talking, especially with a speech I say ALL the time in my job. On day 4 and 5, my muscles ached. I couldn’t get comfortable sitting or when trying to sleep. On day 4 and 5 I definitely felt my brain shift from the fogginess to being clear. I also decided not to do any crossfit workouts while fasting. I didn’t want to push myself on this first long fast and make it any more difficult that it was already going to be. Towards the end of day 5 I was ready to eat. Not due to hunger but more due to the mental side of enjoying eating. I missed eating food. It’s such a ritual in our day and I enjoy doing the things that come with eating, like helping Erika in the kitchen and cleaning up etc. I probably felt a bit bored towards the end too. Some of the things I struggled with during the fast were headaches, intermittent nausea and lack of sleep. Although these symptoms were annoying at times, they did not impact me too much in my day to day life. We had strategically chosen a quiet week for us to complete the fast, so it may have been a different story for me if I was travelling, stressed or had a lot of commitments. I was truly amazed with my lack of hunger as the fast progressed, particularly on days 3, 4 and 5. Even though I woke with a headache most days (this may have been electrolyte related?) my head did clear as the day went on and I did experience a very clear mind and increased energy later in the day. I am actually very proud of myself for not eating for five whole days. In my pre-keto days I would have struggled to miss one meal. At times it truly was a mental game, but I enjoyed the challenge to push myself and get over my fear of being hungry. It was important for me to have a bit of a strategy when it came to breaking the fast, to ensure I didn’t take the opportunity to eat all the things. So we decided for the meal we had when breaking our fast to be very low carb, and then the next day we would only eat one meal and again it would be very low carb. This plan kept me on track and eased me back into a normal eating plan. Would we do another extended fast? We know now that we can do extending fasting. Long extended fasts are not something we plan to do on a regular basis. We would be happy to incorporate it into our lives about once every 6 months to 12 months depending on our circumstances. After successfully completing the extended fasting it made us want to incorporate more fasting into our weekly routine. 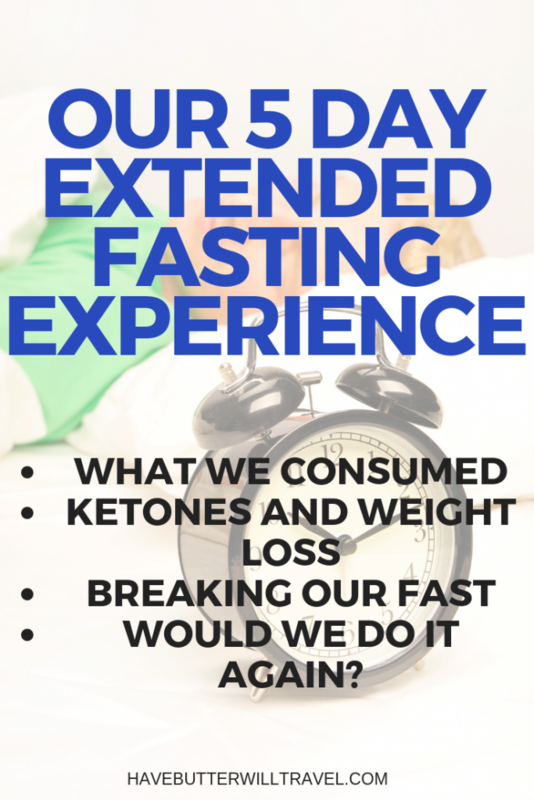 We have decided to begin the Complete Guide to Fasting’s 36 hour fasting protocol. This involves eating 3 meals a day 4 days of the week and then not eating at all on 3 fasting days. Our plan is to fast on Mondays, Wednesdays and Fridays. We feel this is an achievable option for us and look forward to seeing how this makes us feel over the next few weeks. Have you tried extending fasting? 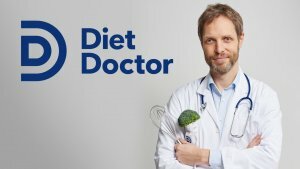 What’s your favourite extended fasting protocol. Please let us know your experience has been with fasting in the comments below.